I'd not normally do this, but this was a very good read, and as I seem to be in the business (O that it paid!) with disagreeing with stuff, it's kinda relevant here. Here's the article: "How to Disagree". I hasten to add I don't know the author, Paul: I simply spotted a link to this on Twitter (thanks @paraic for the heads-up). For my part, I've been aware of the earlier part of the list as "no go territory", as they're just examples of logical fallacies and fairly easy to identify as a waste of everyone's time. They're the stock in trade of the comments section of the likes of the Daily Mail (which are in equal measures hilarious and soul destroying), and the longer comment threads go, the more they tend towards the beginning of that list, I think. This is a variation of Godwin's Law, I guess. I see a lot of the DH1-DH4 on... some tech related forums I participate in. And if yer reading this blog, you probably do too (participate on the forums I'm talking about, I mean). I find it disappointing and unhelpful. And I've pretty much given up trying to communicate with the relevant miscreants. What I try to aim for in my own disagreements is DH5, if not DH6. But of course my tone sometimes lets me down as I wallow around dangerously towards DH0. I'm aware of this, and do actually try to not be so bloody petulant. 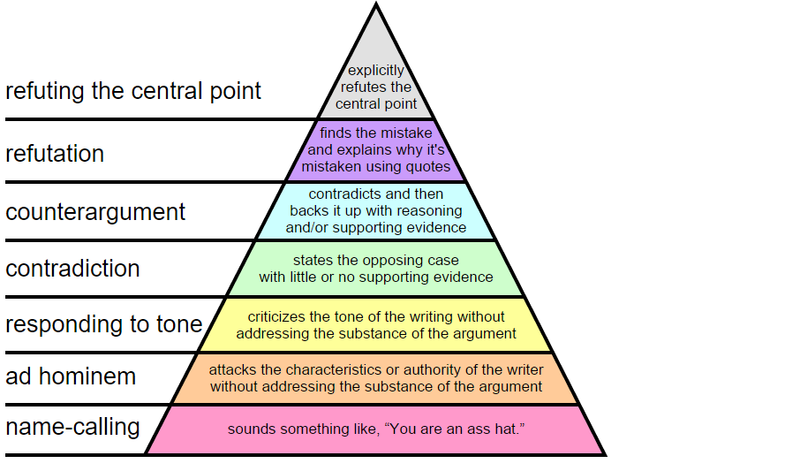 I do like to think that my point / case is generally solid, even if my approach isn't (I'm grimacing as I type that...). Anyway, forget the nonsense I'm typing here. Go read Paul's article. It's excellent. 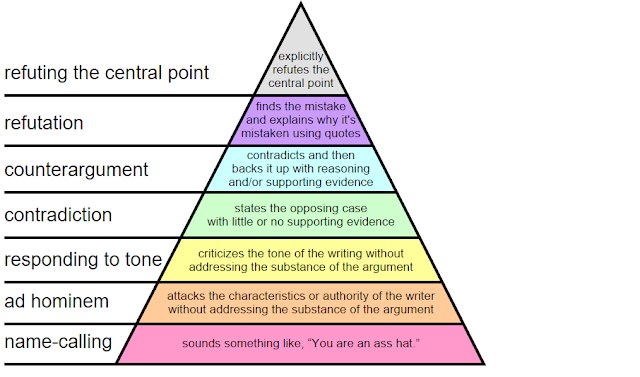 It was hilarious that someone validate their style of communication at me by pointing to this very article and claiming they conduct themselves "towards the top of the triangle", whilst starting their diatribe by calling me thick-headed. O I wish it was on a public forum so I could link to it. Chuckle.